At least 30% of the world’s crops and 90% of all plants require cross-pollination to spread and thrive, making bees an important part of any gardener´s life. From the delicious, antioxidant-filled honey that bees produce to the pollinating they do all over the world to ensure we have enough food to eat and sell, bees are an important aspect to our ecosystem. Learning the importance and interesting aspects of beekeeping as part of a gardening activity is a great way to teach our Washington kids more about their own role within the ecosystem and how to make the world a better place. Three out of four crops across the globe producing fruits or seeds for human use as food depend, at least in part, on pollinators. Bees work hard to pollinate these plants in order for humans to have food, but for wild animals as well. Many natural wild animals in Washington such as raccoons, bears, squirrels and more depend on pollinators just as much as humans do. And, last but not least, with improved pollination management, crop yields could be increased by about 25%, meaning that your garden can grow faster and healthier. This is a great way to encourage children to continue gardening as they will see the fruit of their labor even faster. One study showed that children who participated in gardening projects scored higher in science achievement than those who did not. By incorporating other learning objectives into the gardening experience, such as learning about the importance and life cycle of bees to our environment, children can learn while engaging in an activity that is helpful to the world around them. Take advantage of the fresh air to open their curious minds while incorporating other fun activities such as bee-friendly recipes, photo journal book creations, wildflower scavenger hunts and maybe even an environmental-friendly PSA that you can let the kids write and film themselves. Before you go anywhere near a beehive with kids for the first time, make sure they understand the importance of slow movements and staying calm. It might be a good idea to have them watch a silly bee movie beforehand so they understand that bees are friendly and not scary. You will also need to ensure you have the proper bee safety equipment on hand. 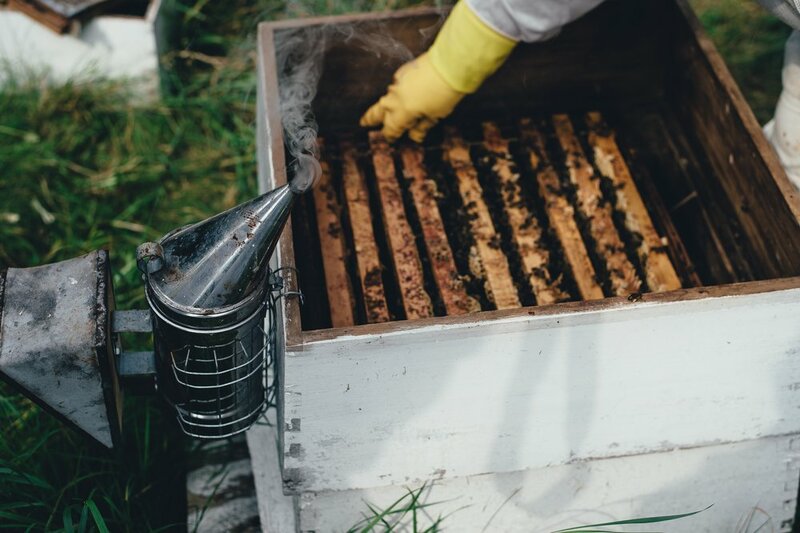 From protective clothing to gloves and a proper hat, this will not only ensure their safety but also allows them to feel more protected the first few times they interact with the bees. As far as choosing a beehive, try to purchase bees from a breeder who is known for breeding calm bees. Time spent gardening is a great way for children to disconnect from their digital world and engage in activities that foster communication and teamwork skills. Incorporating a beekeeping lesson or activity into your daily gardening routine and you will find that your children might feel an increased sense of responsibility as they continue to learn more about the interconnections of bees and the environment. This will help to raise ecologically conscious children that can better understand and contribute to the world later on in life.